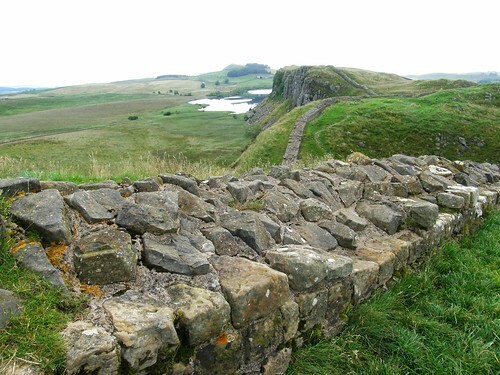 Our final day on Hadrian’s Wall. We caught the early bus from outside the hostel. The sunshine had returned and picking up from Brocolitia the landscape felt more welcoming with the sun on it. 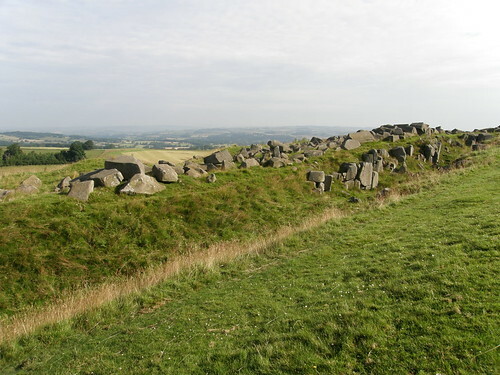 Our steady ascent continued until we reached Limestone Corner, where the ditch which accompanied the Wall is very evident, and also a jumble of large limestone boulders. 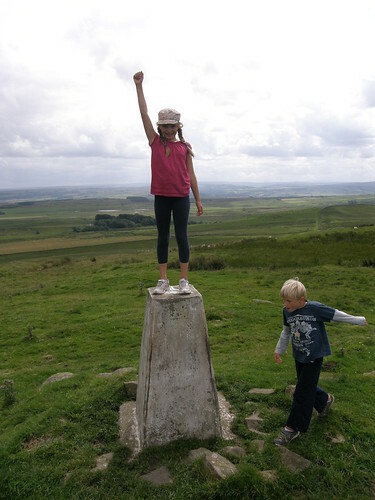 Shortly beyond the boulders there’s a trig pillar…. 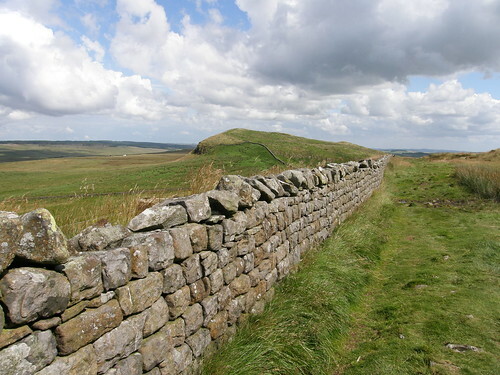 The Wall had been noticeable by its absence for a while, but as you drop away from Limestone Corner there’s a couple of lengthy, impressive sections. At Black Carts turret we stopped briefly for a drink and a snack. 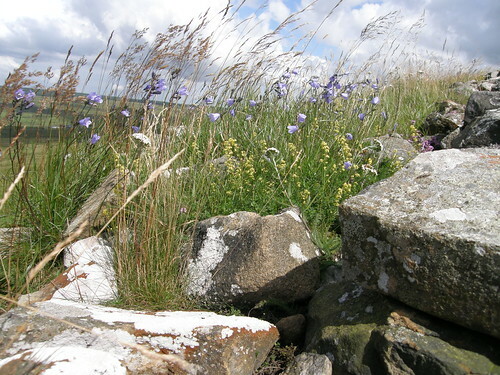 Dropping down into the valley of the North Tyne we found ourselves in a new environment; for much of the last three days we had walked over rough moorland and sheep cropped turf; we were now passing through hedged fields, some of them full of vegetables. We watched four buzzards circling above a small copse. The national trail diverted considerably from what my book and map led me to expect, but fortunately it was well sign-posted. 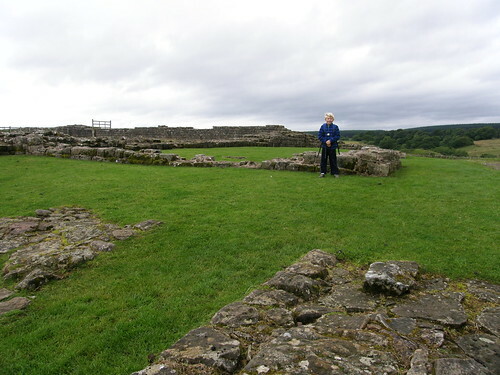 We’d only a short walk to reach the fort at Chesters and with our early start we were there soon after it opened. 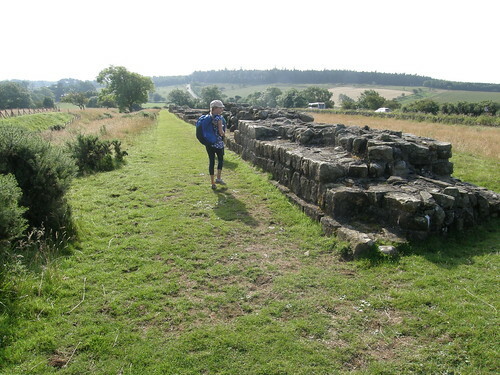 My original plan would have had us arriving at Chesters the previous afternoon and starting again from there rather than Brocolitia. Because we hadn’t, my intention to walk out to Hexham was now a little in doubt. 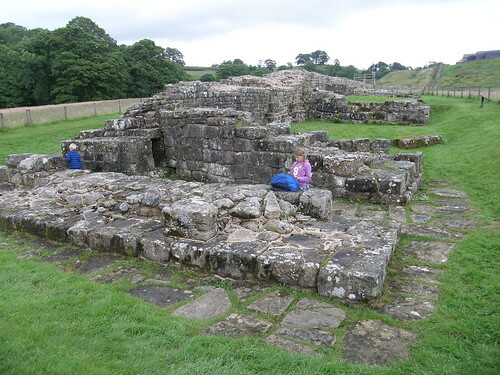 Already slightly leaky, my plan now foundered on the children’s activities on offer at Chesters. 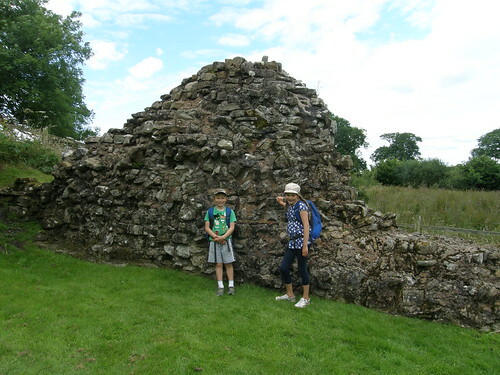 For two hours the kids were royally entertained by three young English Heritage employees. 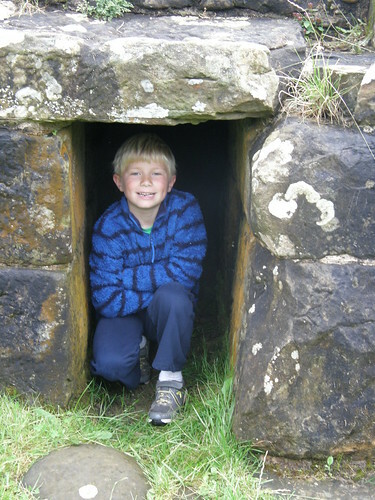 They were encouraged to think like archaeologists. 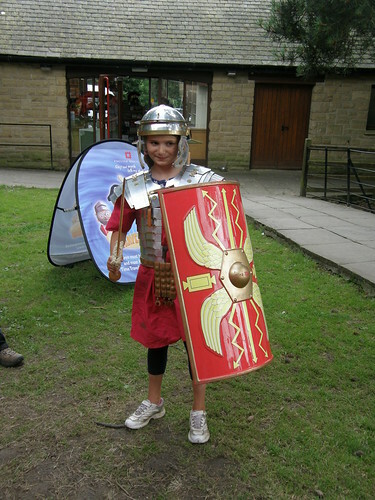 They examined replica Roman household objects and guessed their purpose. They participated in a mock dig and then tried to decide from the odds and ends they had found what kind of person had owned them. And although B looks very serious here, they were both thrilled. Finally, they acted out some tales of Roman life. By the time they’d finished, we were ready for some lunch, which we bought from the little cafe on the site, and ate at the picnic tables outside. The sun was still shining, but it was extremely sticky and to west the sky was black. Sure enough, our meal was seasoned by a dash of lightening and a soupcon of thunder. I thought we would have a sprinkling of rain too, but it never really materialised. …currently flooded. 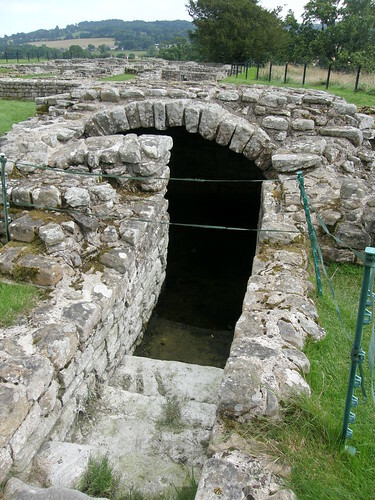 This is where the payroll would be stored, When this was excavated a studded oak door was still in place and some denarii were found on the floor. Next to the principia: the commandant’s house. 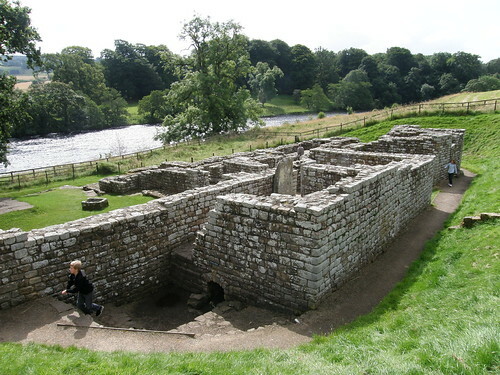 At Chesters this building was refurbished at some point, with the insertion of hypocausts for under-floor heating, and the addition of a small bath-house. 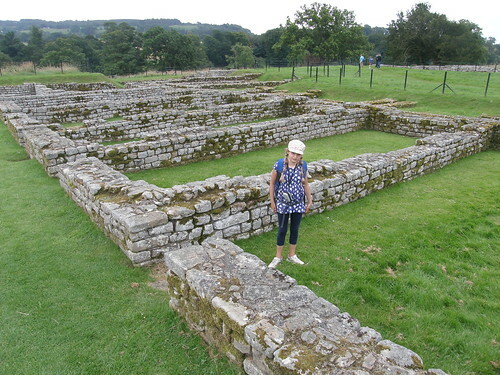 Usually there are granaries too, but at Chesters there’s just a grassy space where you might expect to see those. 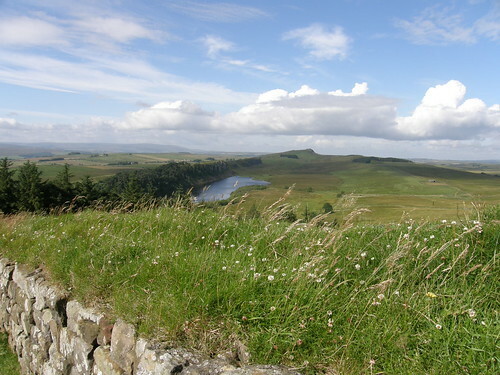 Just outside the fort, where the Romans bridged the River North Tyne (you can just about make out the Wall and the hint of a bridge abutment on the far bank)…. 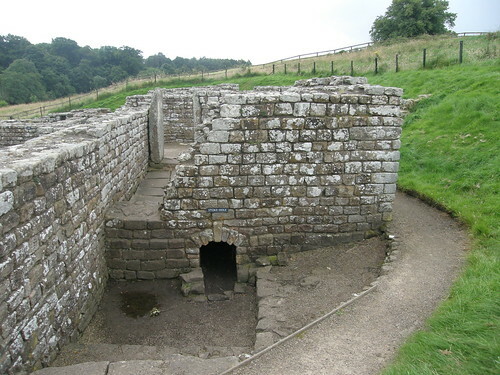 …is another bath-house. This is so well preserved that, for once, it’s relatively easy to imagine the building in use, and to understand what those uses were. …and relaxing in a hot room…. We caught the AD122 for the last time, just outside the entrance to Chesters. Clearly not everywhere had avoided the rain like we had. The bus was awash both inside and out. 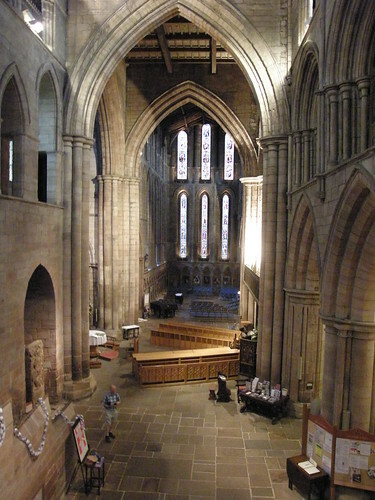 Our luck continued to hold-out whilst we had drinks and an ice-cream outside the cafe by Hexham bus station, and long enough for us to be inside Hexham Abbey when the heavens finally opened. We’d arranged to meet TBH ‘somewhere near the Abbey’ so were delighted to see her pull-up right outside our cafe. She’d come through flash floods on the A69, it seemed we’d had a very lucky escape. Which seems like an appropriate note on which to end, since that’s how I shall remember the whole trip: a very lucky escape. Now, let’s start planning our next escape…. 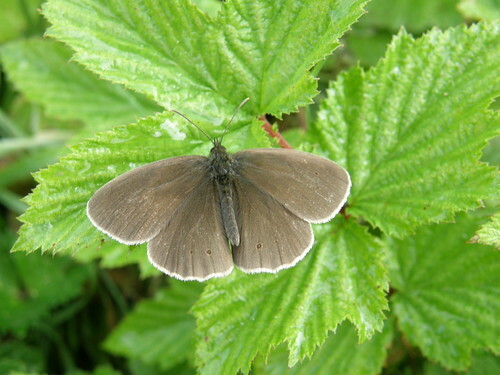 Resplendent in freshly laundered gear we climbed the lane from Once Brewed back up to the Wall, pausing only to admire this very obliging butterfly, which I think might be a ringlet. It was already fairly warm, if a little hazy. 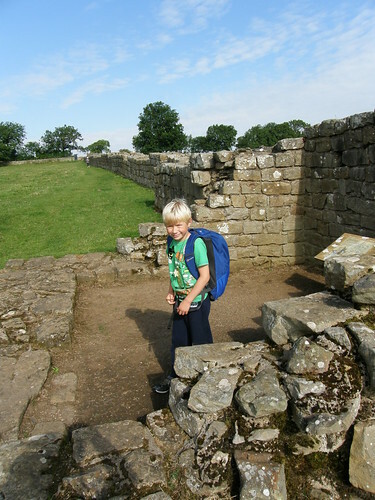 We would be back at Once Brewed that night, so the kids were able to leave their rucksacks at the hostel, and despite the addition of their water-proofs to my bag, I was able to lighten my load too. 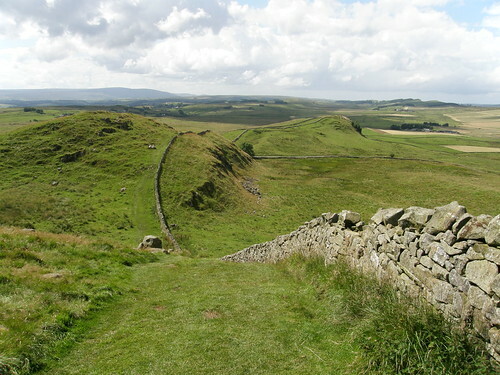 Today’s walk would mostly be more of the roller-coaster ups and downs of the Whin Sill. 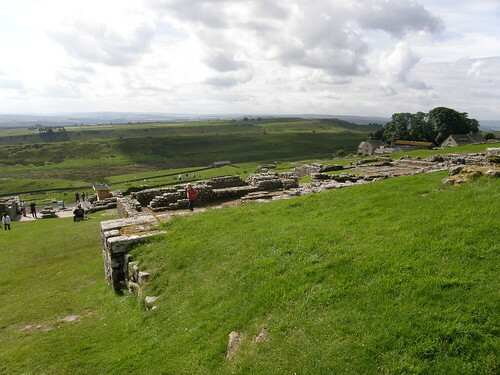 Along Peel Crags, overlooked by Milecastle 39…. 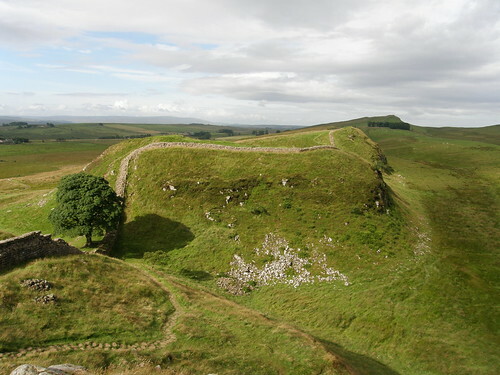 …to the famous Sycamore Gap, which, as Hollywood knows, is perched on the outskirts of Nottingham. I’d expected this part of the Wall to be busy, but we had it all to ourselves. The sun-lit cliff-top walk above Crag Lough was perhaps my favourite single section of our walk. I’ve walked this way before, but I’d forgotten how beautiful it is. 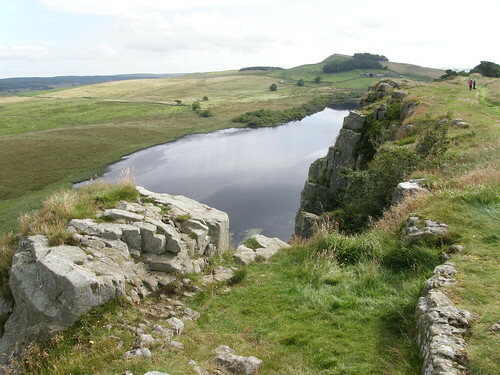 …and forward to Broomlee Lough and the final fling of the Whin Sill at Sewingshields Crags, which we would climb later in the day. 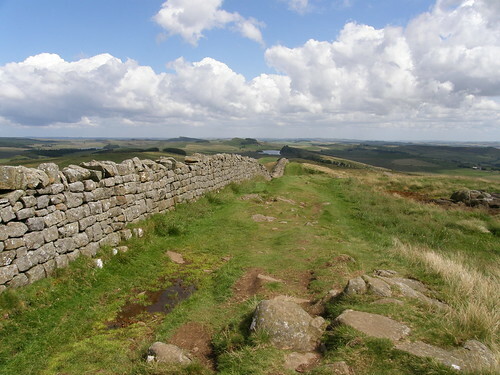 To me, this is one of the great pleasures of a linear, multi-day walk: the satisfaction of looking back to distant places already walked through or past or over and likewise the anticipation of looking ahead to landmarks on the route to come. So the sun shone. 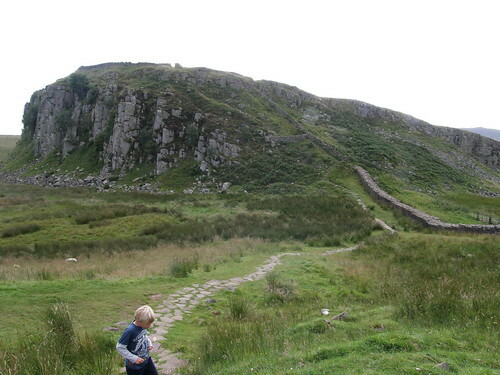 We slowly reeled in Sewingshields Crags. It’s a very simple pleasure. 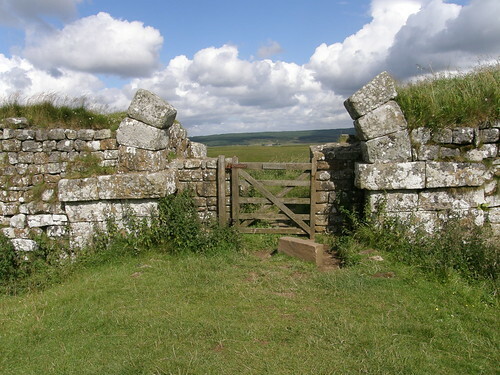 …and the remnants of an arched gateway on the northern side. 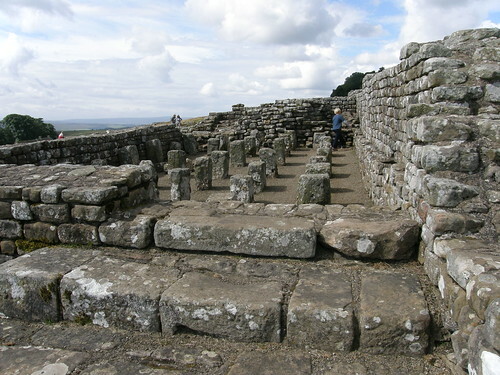 We did finally meet the crowds, when, at around eleven, we arrived at Housesteads. 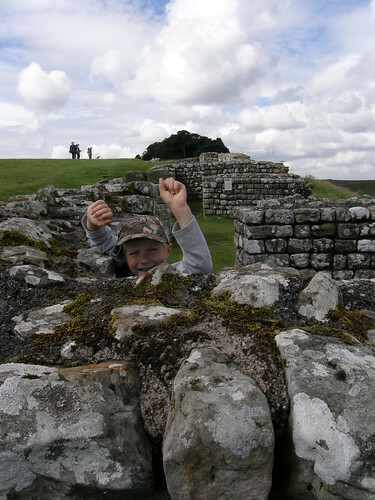 …play a bit of hide and seek…. 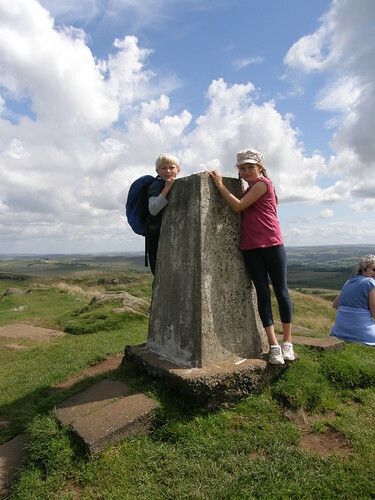 …and cool and dress feet, both children having developed some red spots which suggested rubbing and foreshadowed blisters. Fortunately, a combination of Compeed and surgical tape seemed to do the job and any further problems were avoided. 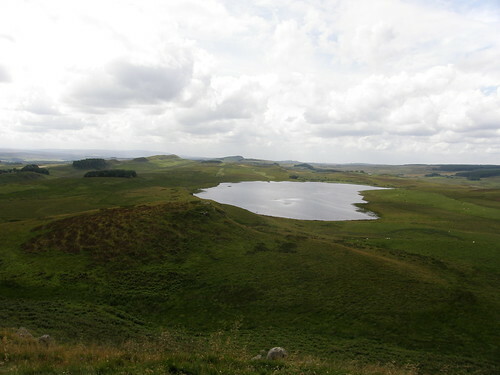 Soon enough, we were looking back on Broomlee lough…. ..and topped out on Sewingshields Crags, at 325m not much lower then our high point of the previous day. 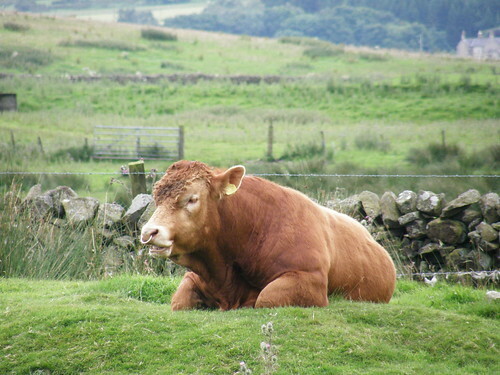 From there a long steady descent to Sewingshields…..
….is followed by Fozy Moss. 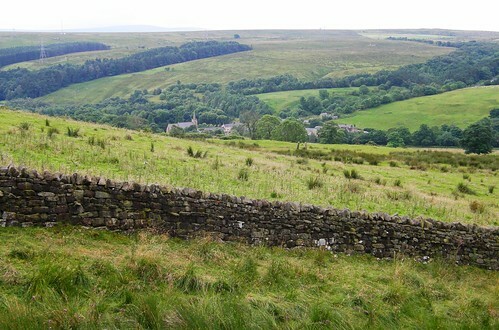 A slightly rising path, shadowing the road, took us across rather bleak, featureless moorland. It might have been rather dispiriting. In fact we passed several large groups of teenagers, heavily laden and heading in the opposite direction to us, presumably D of E victims, some of whom were singing to keep up their spirits, and some of whom were openly weeping. 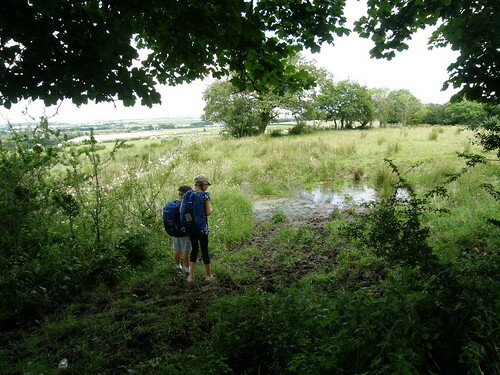 It was saved for us, bizarrely, by the fact that we regularly had to negotiate wet and muddy ditches running across the path, which the kids found perversely enjoyable. 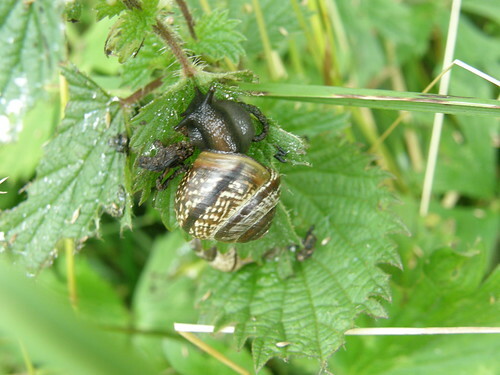 At Carraw, where the path diverts slightly away from the road around a farm and a small woodland, the flagged path was bordered with nettles and the nettles were festooned with snails. Rich brown, striped and flecked in pale yellow, I thought they were rather handsome. 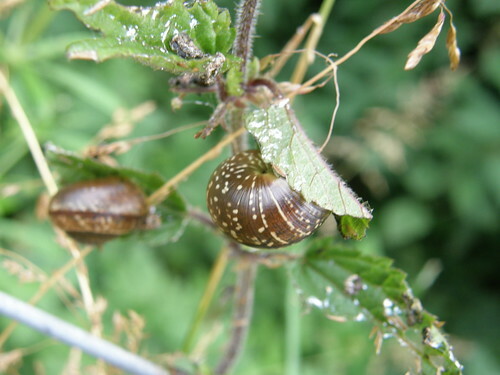 I think that they might be copse snails? I’d originally planned to finish at Chester’s, but it had soon become apparent that this was much too ambitious. That would have made for a much longer day then any of the others and time was against us. Whether we dawdled or, as I thought we had today, generally kept moving, we seemed to pretty consistently manage a mile and a half an hour. So, we chose a new destination: Brocolitia. 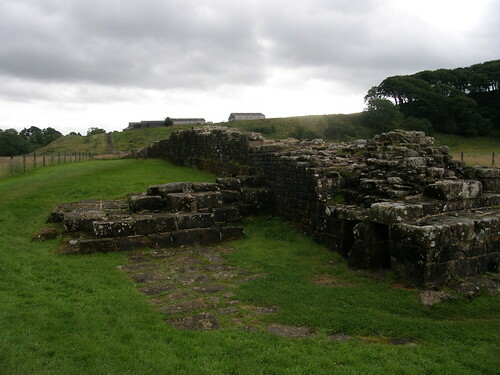 Brocolitia is another Roman fort. 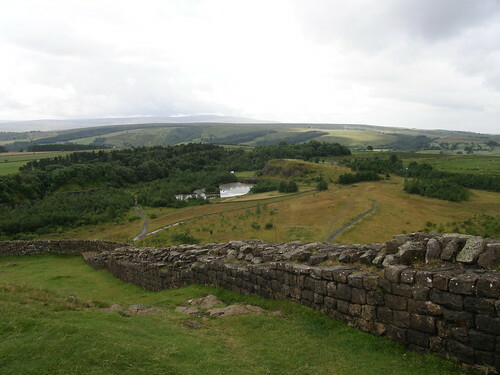 There isn’t too much to see – the grassy mound on the right of this picture shows how the unexcavated outer walls look. 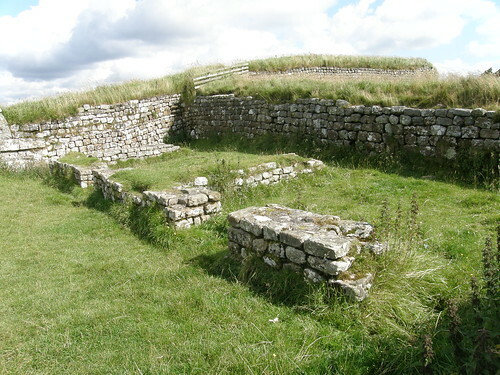 But outside the fort there is a small temple to Mithras, a god popular with Roman soldiers. 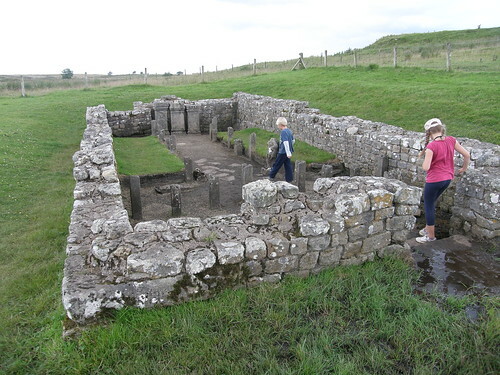 The site is boggy and the conditions preserved the timber pillars, replaced now with concrete casts, as have been the three altar stones and a small headless statue. 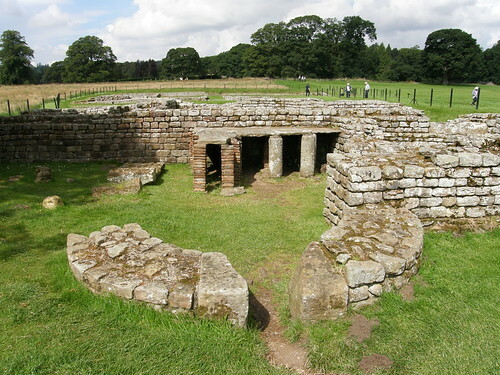 More importantly for us, Brocolitia has a bus-stop for the AD122, which took us back to Once Brewed, where we would eventually get fed and watered and reconvene our card school. 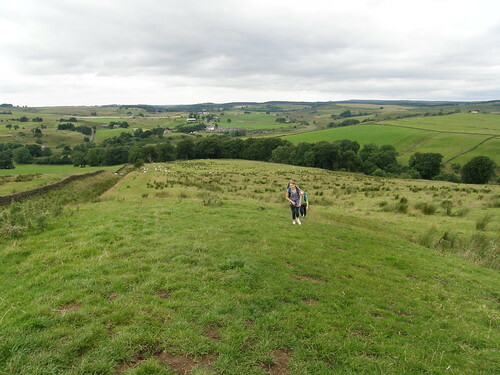 Leaving Greenhead we retraced our steps up to the Walltown Quarries which are just beyond Carvoran and the Roman Army Museum. 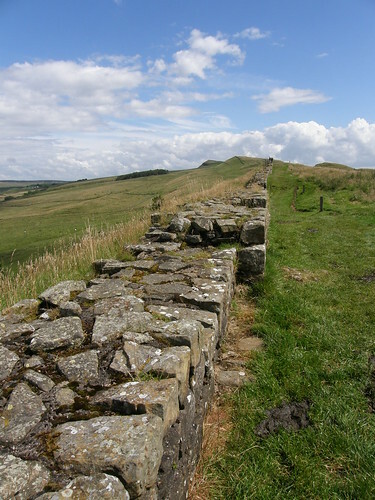 We were into the iconic section of the Wall now, where it dips and climbs along the hard basalt reef of the Whin Sill. There’s a fair bit of up and down. In retrospect, I realise that the kids coped very well with it. In one particularly steep-sided trough we were overtaken by a fast-moving, jocular group of four guys. Or rather, a group of three and one straggler. Sweat was pouring off the unfortunate tail-end-Charlie as he pounded past us. “In a hurry?”, I asked. “Trying to do the Wall in two days”, he panted. I suppose that’s one approach. The clouds had become increasingly dark and threatening through the morning and when we arrived at the car park at Cawfields Quarry it finally began to rain. Although we had a fair accumulation of snacks between us, we had no clear plan for lunch, so it was a great relief to find two ladies selling tea, soup, sandwiches, sausage-rolls and cake from the back of their car (The Pop-Up Cafe). They seemed to be doing a roaring trade. Their dog joined us whilst we ate, sitting at the solitary picnic table. Apparently there used to be more tables, but they were swept away in a flood. Which was a cheery thought given that it just begun to rain, but by the time we were ready to leave it had stopped again. Whilst I was faffing about, taking the photo above a weasel, or stoat, ran across the gateway in the background. Pretty soon the cloud was breaking up, the sun emerged and from that point on it was a glorious day. 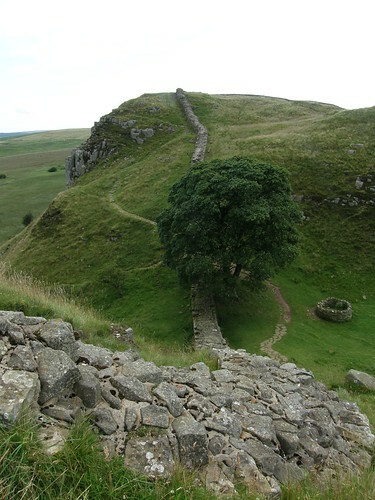 The Whin Sill is not particularly high, but it’s a great vantage point and the walking from here was truly magnificent. I’ll let the pictures speak for themselves…. 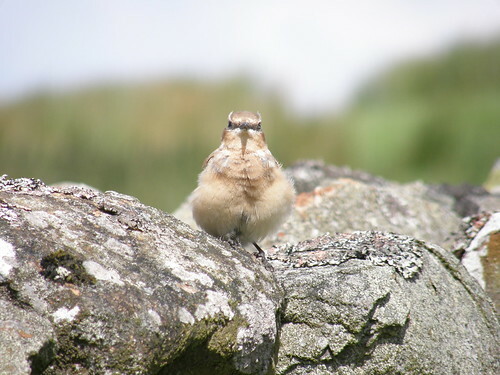 …is a whinchat (but as usual, I’d be glad to be better informed). It was unusually calm about our proximity and let us get very close before finally taking to the wing. 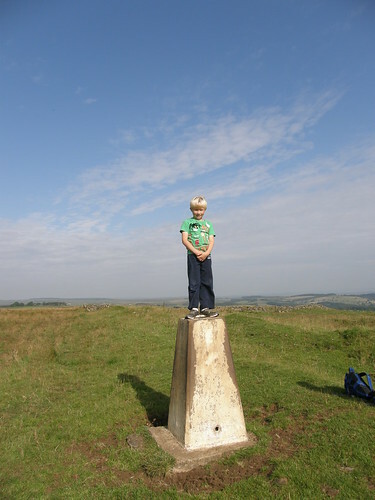 …is the trig point on Winshields Crags, at 345m the highest point on the Wall. Incidentally, Watson’s Dodd in the Lake District is 789m. 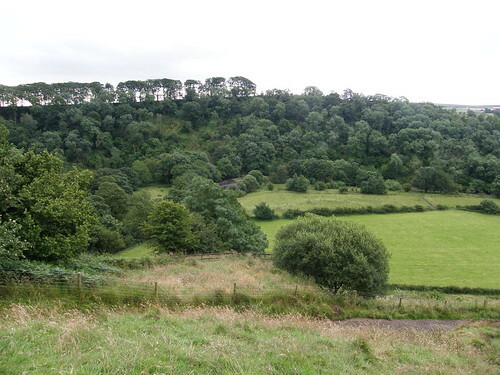 Has anybody thought of listing hills with consecutive digits spot heights? Baggers everywhere would love it! There must be a book in the idea. Hills of this sort would have to have a name….., hang-on, talk amongst yourselves…..Got it: Consecutive Ordinal Digits Found In Spot Heights. The views ahead to Crag Lough were enticing, but that would have to wait until tomorrow. 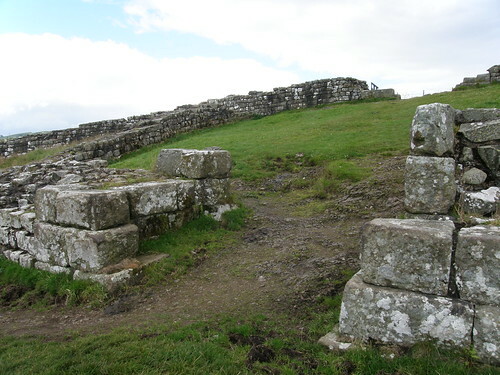 Vindolanda lies on the Stanegate Road and like the road it predates the Wall. 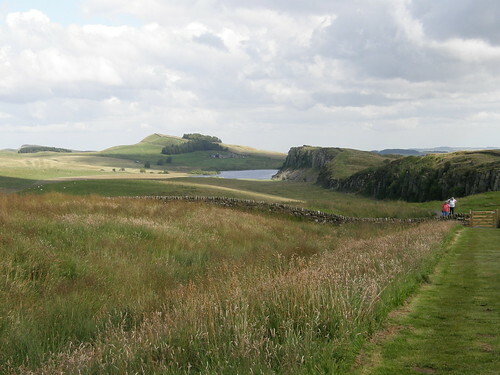 I came here once before, when I walked the Pennine Way with my Dad, but in the intervening years I’m sure that a great deal more had been uncovered. Since the place was occupied for Centuries what’s here is not one town and fort but several superimposed. 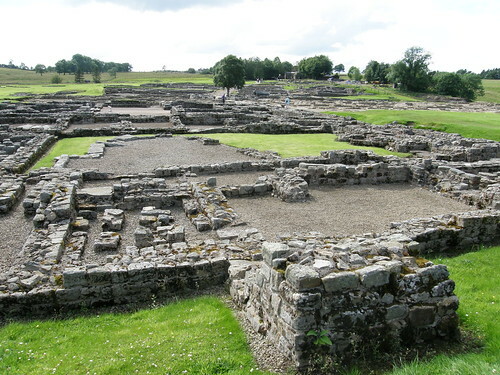 It’s a live archaeological dig and what’s really impressive is that the treasures which have been unearthed here are all on display in the Chesterholm museum which is adjacent to the remains. The museum really is stunning. 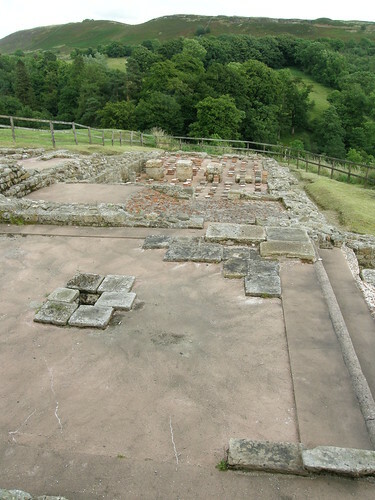 Some of the coins, pottery and jewellery in particular, have been so well preserved that it was hard to believe that they weren’t fresh from the mint, the kiln or the smithy. 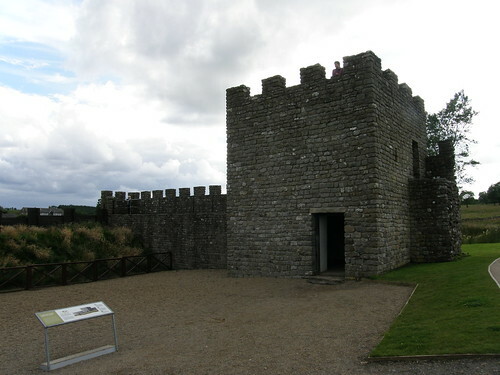 I think what the kids most enjoyed however, were the replica sections of wall – one of stone and one of timber and turf. On day two we were up and out bright and early. Breakfast didn’t delay us for long, consisting as it did of only a couple of glasses of water. 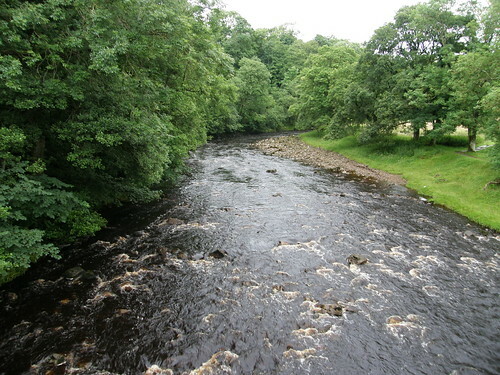 However, the village of Gilsland wasn’t too far away and I’d done my research before we set-off: I knew that there was a cafe there which did an all day breakfast. 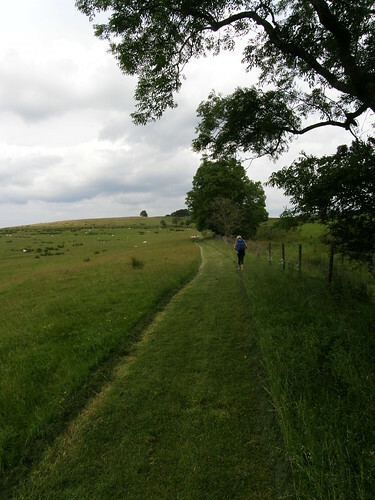 What’s more, I now knew, thanks to an information board I had read the previous day, that our walk to Gilsland would be shorter than I had expected. 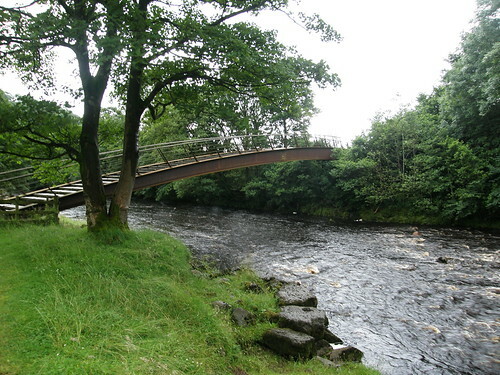 I’d discovered that a ‘new’ footbridge, built in 1999, not shown on my map or mentioned in my guidebook, would take us across the River Irthing without needing the diversion from the Wall which I had thought to be necessary. 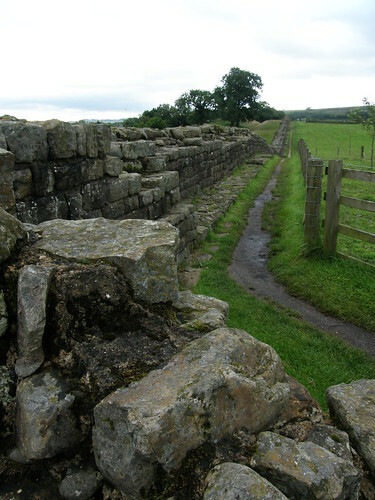 To the remains of the eastern abutment of the old Roman bridge. 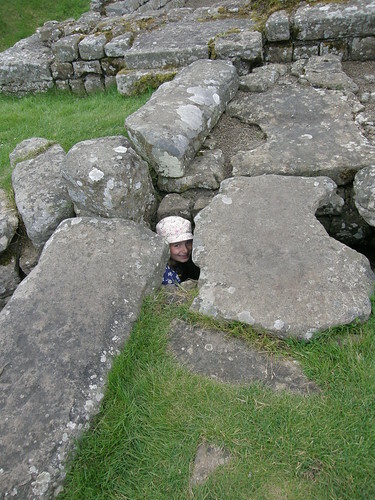 …the kids were happily crawling about in a small passage. 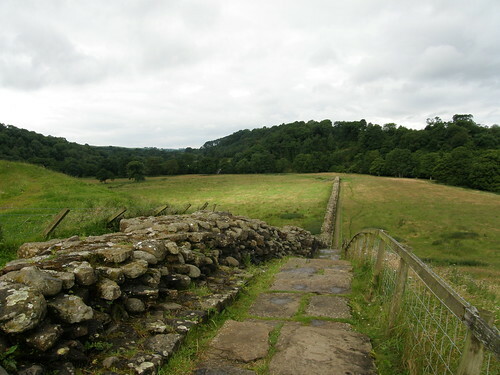 I’ve walked several parts of the Wall before, but never this section between Birdoswald and Gilsland, and I have to say: it’s well worth a visit. 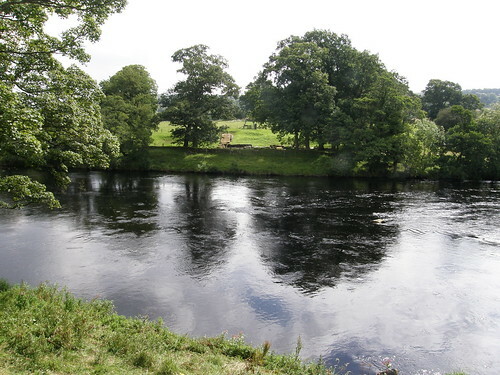 Especially if it’s followed by a visit to the House of Meg tea room in Gilsland, where we had a sumptuous breakfast, not at all the dainty disappointment which the phrase ‘tea room’ might lead one to fear. 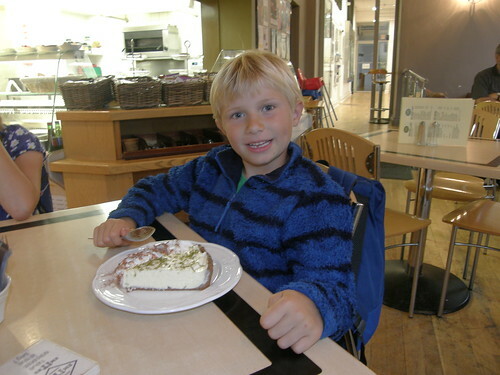 The cafe doubles as a village shop, so we were able to stock up on a few snacks to keep us going too. 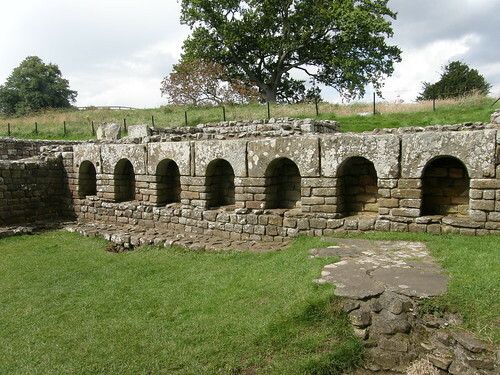 Poltross Burn milecastle sits on the outskirts of Gilsland. From there a sometimes boggy path follows the line of the Wall, which has disappeared again, although the ditch is still very evident. 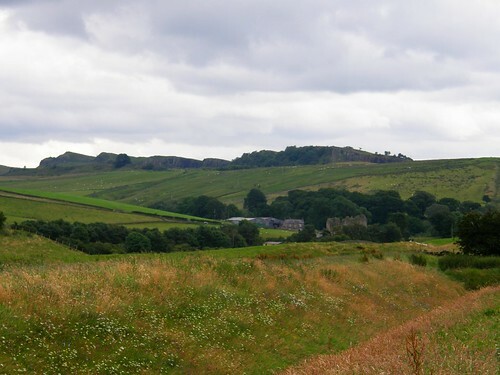 Ahead we could see the notched skyline of the Whin Sill rising above the ruins of Thirlwall castle. 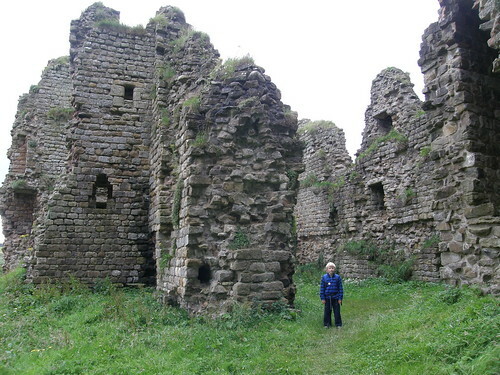 So we went to investigate the castle. 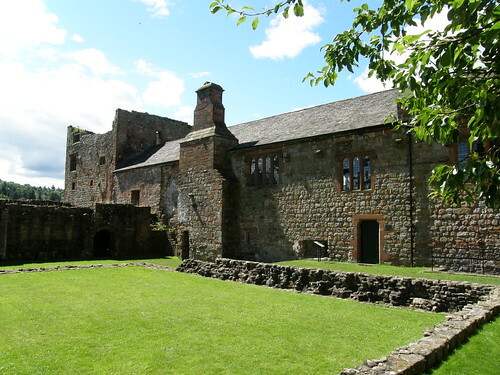 It’s 14th Century apparently, and like Lannercost Priory, partially built of stones ransacked from the Wall. 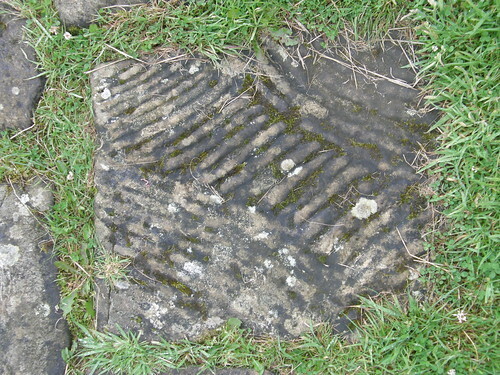 Legend has it that a solid gold table, hidden down a well here when the castle was under attack, has never been recovered. 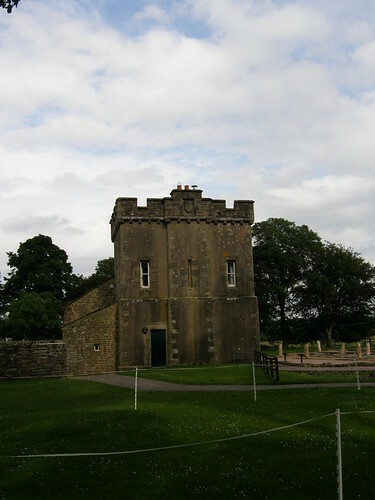 Much to my amusement, the kids cast aspersions on the idea that somebody who owned a solid gold table would live in such a modest castle. 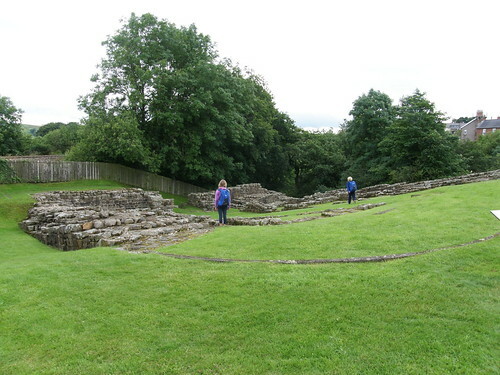 …and through the unremarkable former site of Carvoran, a Roman Fort, to the Roman Army Museum, where we spent a very happy afternoon whilst it rained outside. This is very much in the modern style of museum, more presentation than exhibits, but we enjoyed our Latin lesson, the Army recruitment speech and especially the 3D film (twice). 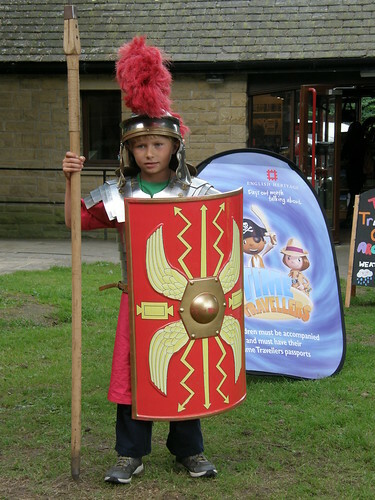 Of the actual artefacts on display the one which sticks in my mind is the Roman Empire’s only known surviving helmet crest found at Vindolanda. It’s made from moss. We would see a wig there the following day, of the same materials. Apparently, it discouraged the midges. Astonishing to think that something made from moss could survive intact for almost two thousand years. Finally we dropped back down to Greenhead, where we were booked into the hostel, once a Methodist chapel, then a YHA hostel, now operated by the Greenhead Hotel which is just across the street. 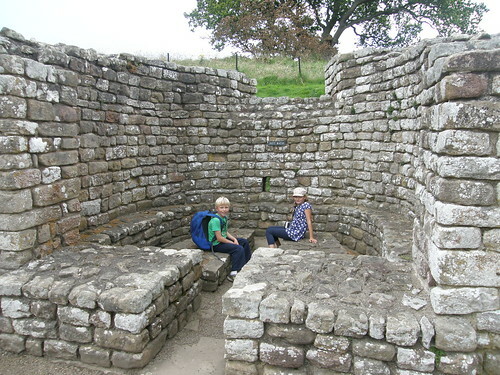 It was very comfortable and great value (much cheaper for us than the YHA). We had the place entirely to ourselves, which we all found a little spooky, especially when we discovered that a ghost seemed to have turned on one of the showers. I was thoroughly ashamed of myself, flinching from my own shadow, and didn’t mention to the kids how I felt until they expressed much the same disquiet after we’d left. Subsequently, I’ve learnt that CJ and his son also had the place to themselves and they too were a little unnerved. Perhaps the place is haunted. Or perhaps we’re just not well adjusted to genuine solitude and quiet. We had our evening meal and breakfast in the Hotel, where there was plenty of company and chatter, and very pleasant they were too. We were home from Wales long enough to wash some clothes and squeeze in a family party. Then A and B and I were off again. My daughter A is really keen on her walking and, for a long time now, she has wanted to try a longer walk over several days. Naturally, I didn’t need any persuading and when we began to plan a trip for this summer, B, although he had some reservations, decided to join us. 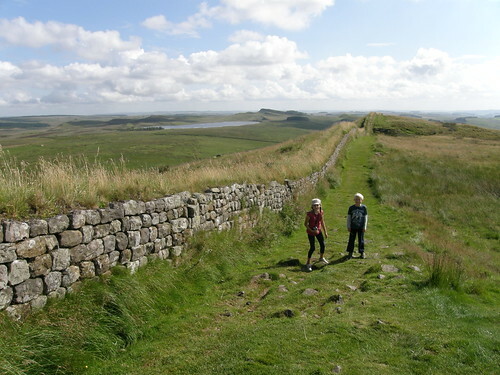 The choice of Hadrian’s Wall for our walk came after a conservation with my friend CJ on one of our Wainwright/Birkett bagging trips, when he told me about walking a section of the Wall with his son, who is close to A in age. 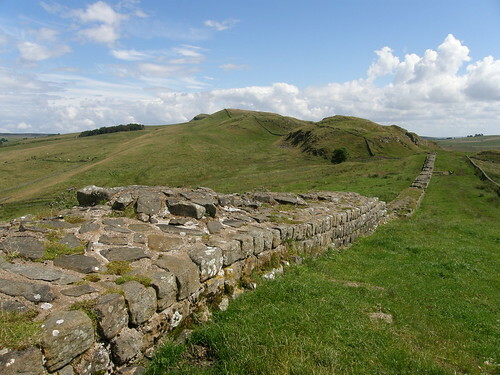 Like CJ we chose to walk a central portion of the Wall, starting from Brampton and finishing at Hexham, both towns close to, but not on, the Wall, although in the event we actually finished at Chester’s Fort, a little short of Hexham. 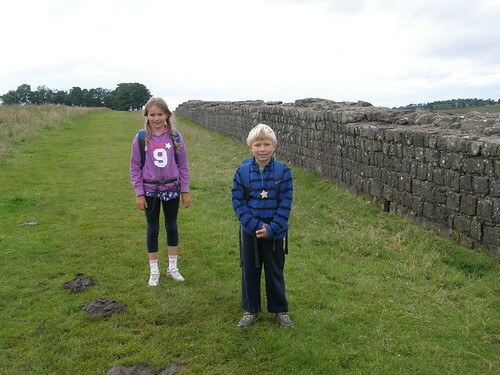 The aim was to walk shortish distances each day, with plenty of time set aside for exploring Roman sites and looking around museums. Where necessary we used the AD122 shuttle bus to get to and from the Youth Hostels we stayed in. Had the weather taken a turn for the worse at any point, I wouldn’t have been averse to using the bus instead of walking if that proved necessary to keep everybody happy. In the event, the weather was very kind to us. We had lots of sunshine, but also, quite often, threatening clouds, and it often looked like it was going to rain. On one occasion we saw flashes of lightening and heard rumbles of thunder. But when the rains came it happened overnight, or in the evening when we were safely ensconced in a hostel, or when we were in a museum, or a cafe. 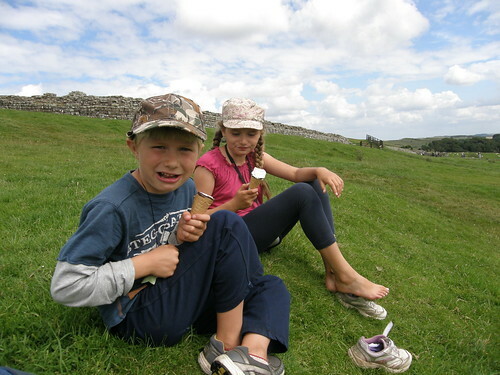 Only once in five days did the kids don their waterproofs and that was for a light, short-lived shower, which never really amounted to much. 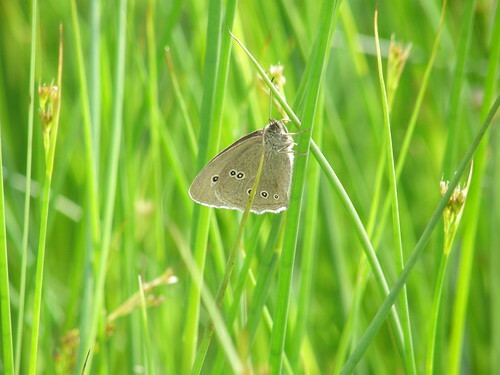 Tucked away in my rucksack were a small ball, a light-weight cloth frisby, a pack of playing cards and a pocket kite. We didn’t get around to flying the kite, but we played with the other three a great deal, and when we do this again, I will take all four again. 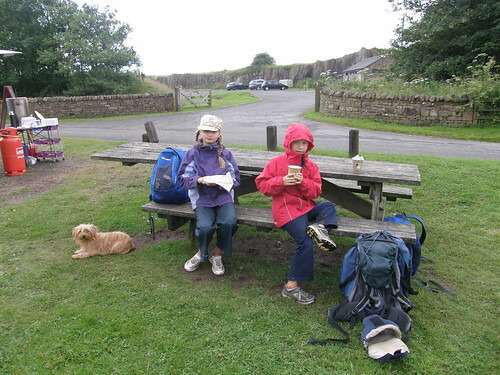 The kids had their own rucksacks with snacks, drinks, waterproofs and changes of clothes. After the first day, when B complained of sore shoulders, I carried his water bottle and some of his clothes, which seemed to solve the problem. We travelled very light, with a plan to wash our clothes in the laundry at Once Brewed hostel. TBH and S dropped us off in the centre of Brampton. 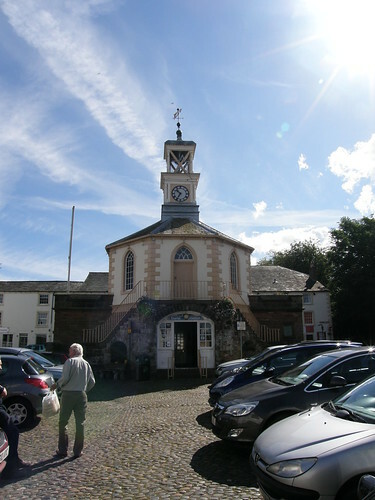 This is the Moot Hall (1817), now a Tourist Information Office. 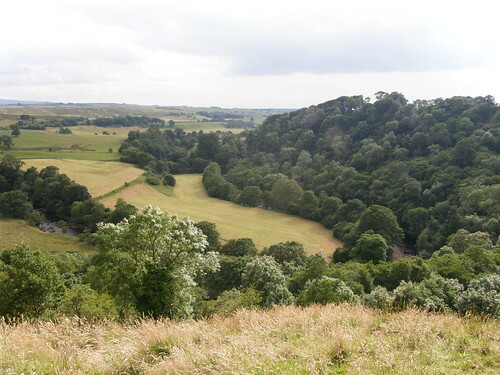 In the sunshine, it seemed like a very pleasant town, although we were soon out of it and climbing briefly, but steeply, up the Moat, the site of a former Motte and Bailey Castle. 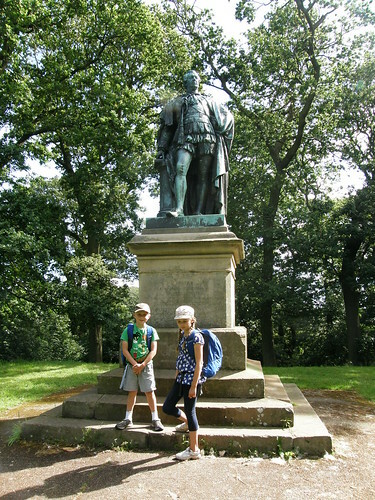 The top is graced by a statue of George Howard, the 7th Earl of Carlisle, politician and poet, who corresponded with Wordsworth. 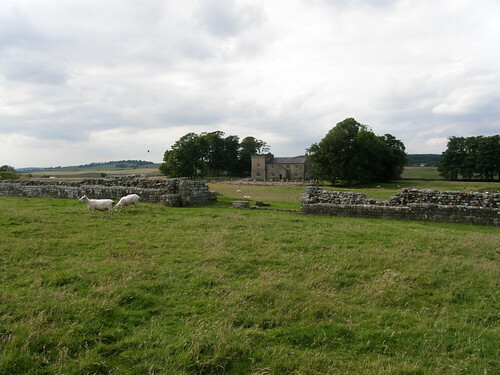 The Howards lived at nearby Naworth Castle, so perhaps that’s why he’s memorialised here. 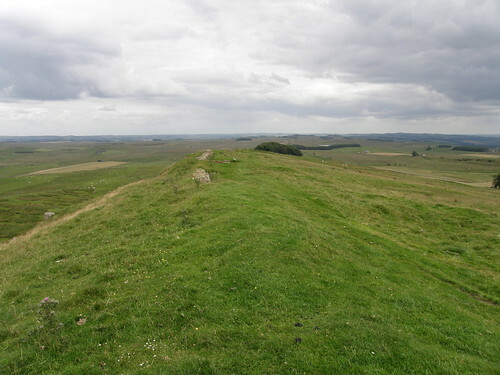 The guidebook we were using, Ian Smith’s ‘In and Around South Tynedale and Hadrian’s Wall’ (highly recommended), mentions the expansive view from the top of the Moat, but that view was interrupted by the mature trees which surround the summit. 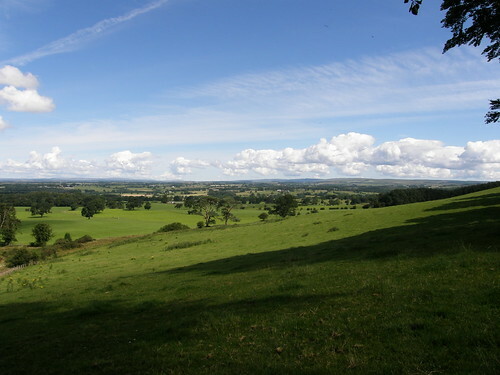 However, the next part of the walk took us along an avenue of trees following a ridge, from which we enjoyed the promised vistas. 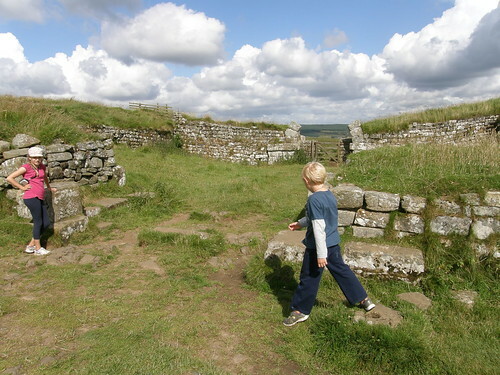 If you were intending to follow in our footsteps, English Heritage membership would be a must, and this would be your first opportunity to take advantage of it. 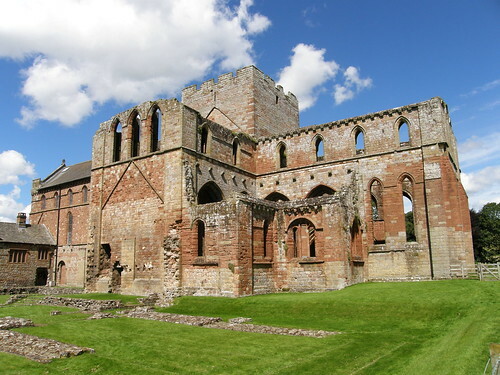 Part of the priory is still used as a church and other parts are ruined. 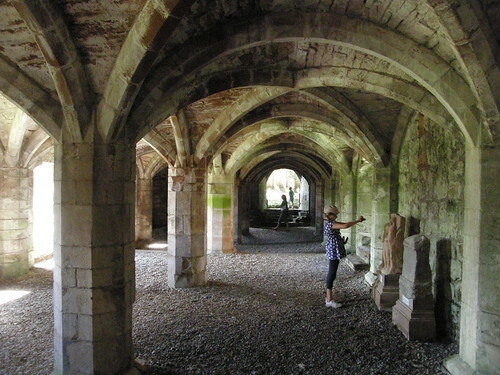 Much of the stone used to dress the priory came from the Roman Wall. 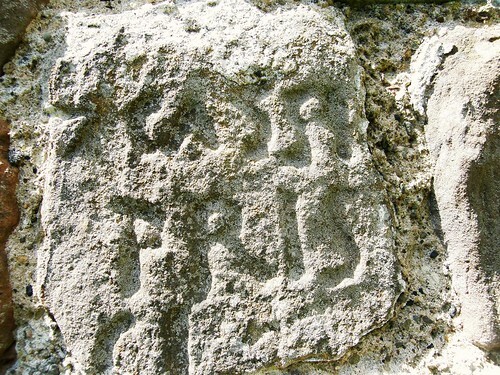 There are a couple of inscriptions made by the legionaries who built the Wall. 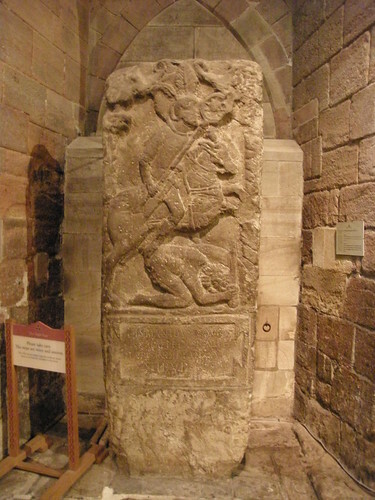 The priory also has some Roman statues and altars on display. 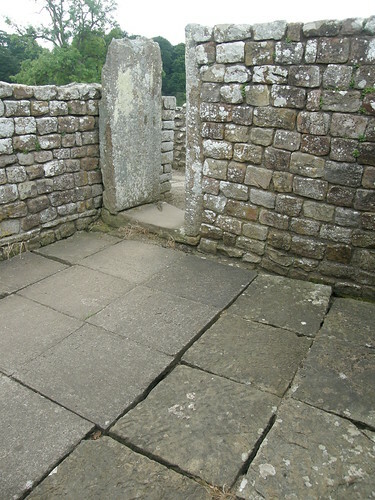 In the far windows in this room bored monks have scratched games onto the broad stone sills. We thought that perhaps they had been playing Nine Men’s Morris. 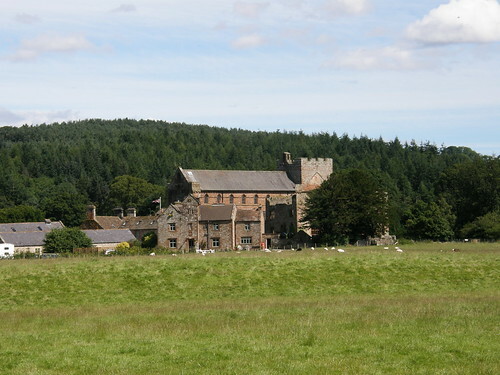 After the dissolution of the monasteries part of Lannercost was turned into a house by the Dacre family. Presumably, they were in favour with King Henry. 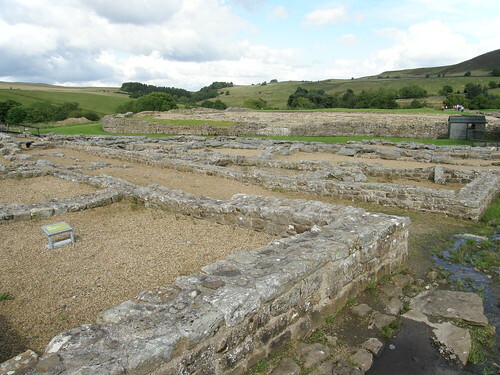 One of the buildings near the priory houses a farm shop and a cafe. TBH and S had driven to meet us and joined us for lunch. The kids discovered how much better a toasted sandwich tastes if it’s called a Panini (and priced accordingly). I had the chicken in a basket which was very good, and I didn’t have to change into flares and a kipper tie for the occasion. The farm shop was a major disappointment. I’d envisaged local cheeses, free range eggs, baskets brimming over with fresh, succulent veg; I should really have expected knick knacks, chutneys, expensive short bread and general tourist tat. This was a bit unfortunate, since I had been hoping to stock up here on tasty local produce to make a picnic tea. Now we would have to rely on the hostel shop. Oh dear. 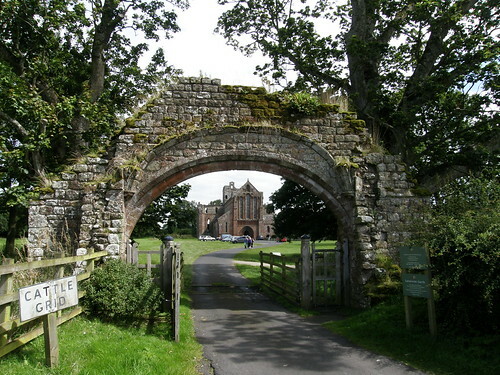 The priory through the old gateway. 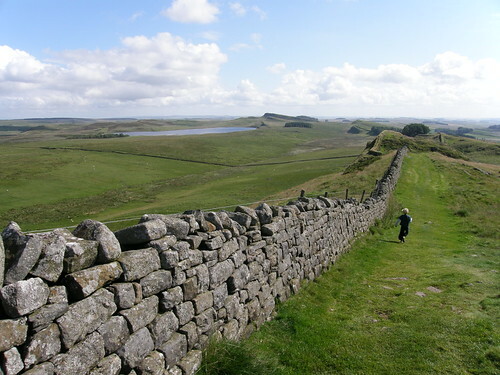 A steady climb northward, out of the valley of the Irthing, brought us, for the first time to the line of the Wall. 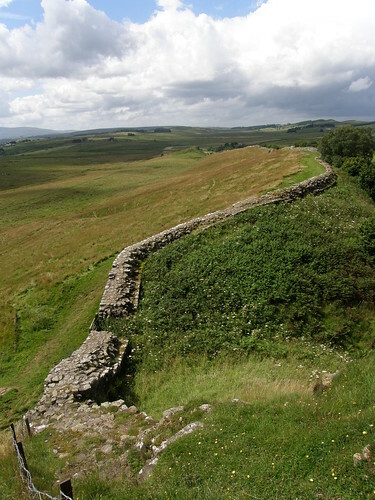 This section, west of where the Wall crossed the Irthing, was originally a turf wall, which was then replaced with a stone wall. 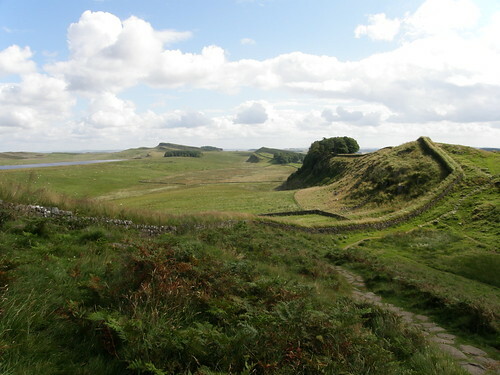 There’s not much to se of it now, but our route did follow the large ditch which ran along the north side of the wall, and which after the wet summer we’d been having, was full of water in places. 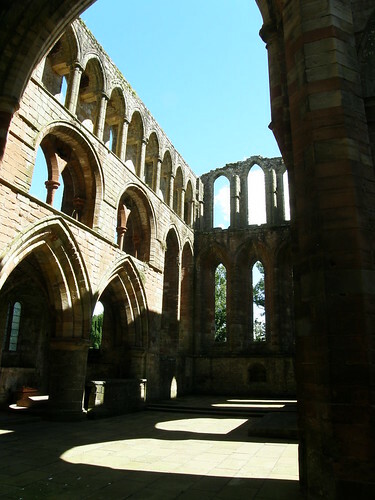 …but that’s a little misleading, since this is the result of some Victorian reconstruction. 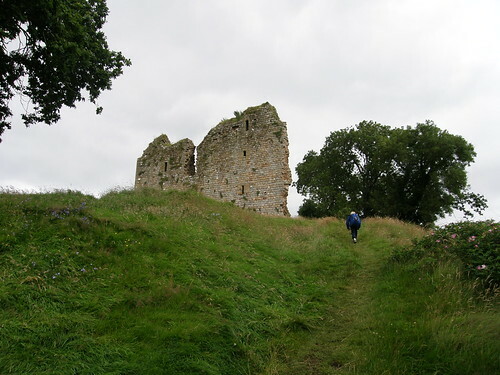 After that we were following a minor road, with some reasonably impressive remains alongside, including some turrets. 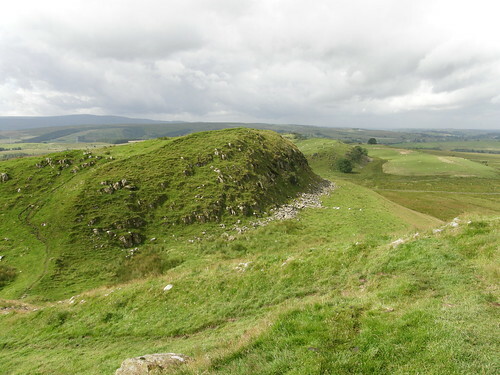 Both the map and my guidebook suggested that we would be following the road all the way to Birdoswald, but in fact a new path has been created which follows the Vallum, another ditch and a mound built after the Wall, shadowing it’s southern side and as far as I can gather, providing a sort-of militarised zone between itself and the wall. 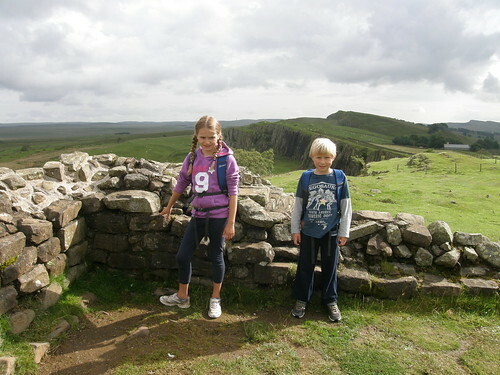 On the Hadrian’s Wall National Trail navigation is a doddle. There are signposts and acorn markers galore, and in case that isn’t enough, the path has been mown to make it stand out. This part seemed to have been so recently done, I kept expecting to overtake a man with a mower. 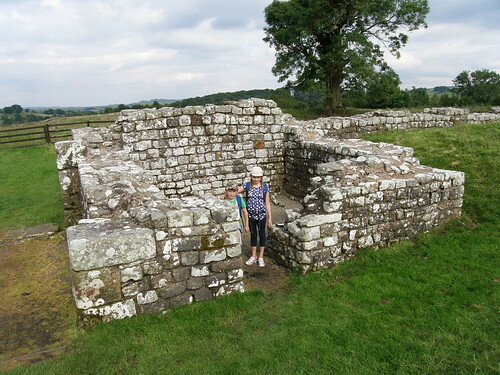 The children were beginning to flag when we arrived at Birdoswald, but I managed to persuade them that before we booked into the Youth Hostel…. 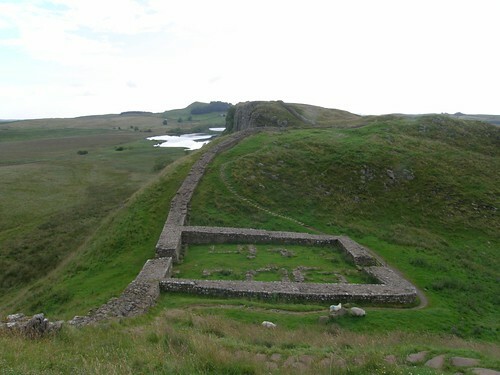 The fort and the the hostel, with Hadrian’s Sheep. Beyond the southern wall of the fort there’s a bench with a magnificent view looking over a steeply banked bend in the Irthing. 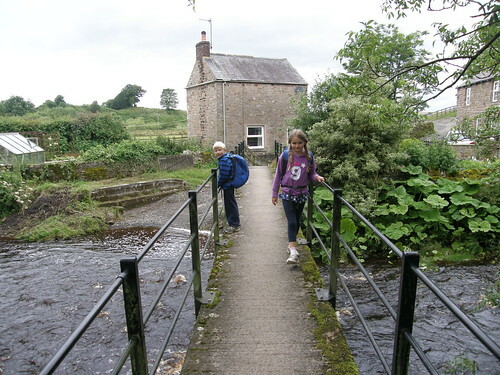 Birdoswald hostel has volunteer wardens and doesn’t provide meals. How did we get on at the hostel shop? Two tins of Cream of Chicken Soup. B wolfed down a bowlful, then some seconds. It’s marvellous what an appetite will do. I had to give them the supplies I’d laid in for breakfast to supplement this Spartan offering. But I had high hopes for breakfast…..